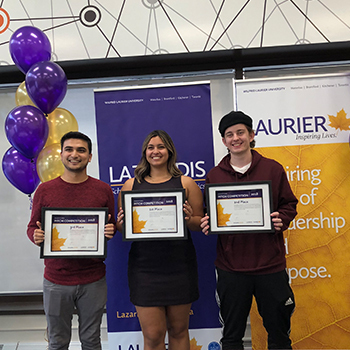 Wilfrid Laurier University’s Brantford LaunchPad incubator hosted its first-ever pitch competition last week, bringing together community members, students and alumni to compete for seed funding in support of their business ideas. The competition was sponsored by the Brantford Ambassadors group with special thanks to Scott and James Pelton, Henry Hagey, Don Wilkin and the Brant Community Foundation, Paul Williamson and Dean Braund. Scott and Henry also served as judges in the final round of the pitch competition. Scott is a partner with Round13 Capital and Investment Director with the MaRS Investment Accelerator. Henry is a lawyer and entrepreneur who has supported the Brantford community for more than 40 years. This event was made possible thanks to the contributions and support of this tremendous group. The competition was divided into a student stream and a community stream. The student stream, comprised of current Laurier Brantford students, saw pitches from a broad range of companies with a focus ranging from product upcycling and portable party gaming to video digitization and curriculum-based dance education. The community stream was equally diverse, with businesses ranging from music education, media production, volunteer management, and comic book creation to a social volunteerism application and virtual reality communication training. The top 3 pitches in each stream were awarded seed funding. 3rd place earned $400 in seed funding, 2nd place $600, and 1st place earned $1000 to contribute towards their business goals. As a whole, the quality of the ideas, business plans, and professional presentation skills of all the delegates were impressive. Congratulations to our top teams in each stream! LCI Movement, the 1st place company in the student stream, was founded by Maya Saggar to address the gap in curriculum-based dance education. The LCI programs meet the expectations of the Ontario physical education curriculum dance requirements. Through events such as the LaunchPad Brantford Pitch Competition, students like Maya are able to connect with one another, as well as mentors and community members interested in innovation. “Opportunities like the Brantford Pitch Competition, LaunchPad, and other initiatives run by the Schlegel Centre for Entrepreneurship & Social Innovation give student entrepreneurs the opportunity to take their ideas to the real world, without having to choose between education and our venture. The supports made available by Laurier have given me the opportunity to continue to succeed in my degree, while also making valuable progress on my venture.” - Maya Saggar. LaunchPad is run by the Schlegel Centre for Entrepreneurship & Social Innovation at Wilfrid Laurier University. On the Brantford campus, LaunchPad provides support, mentorship and resources to startups, both traditional enterprises and social ventures, founded by Laurier students, alumni and community members. Congratulations again to our winning pitches, and to all who presented their ideas!